A watershed is a specific land area, which can be identified by tracing a line along the highest elevations between two areas on a map (often a mountain ridge or divide) within which water flows to a common body of surface water (i.e., stream, river, lake, or ultimately, the ocean). Surface water is comprised of shallow ground water discharges (i.e., springs or seeps) and runoff from precipitation events. Please view the watershed diagram below. Source: Primary components of a watershed (Heathcote, 1998). However, a watershed also includes the ground water that lies beneath the land surface and is associated with the surface water bodies, called ground water. Ground water infiltrates into the underlying soils and rocks. 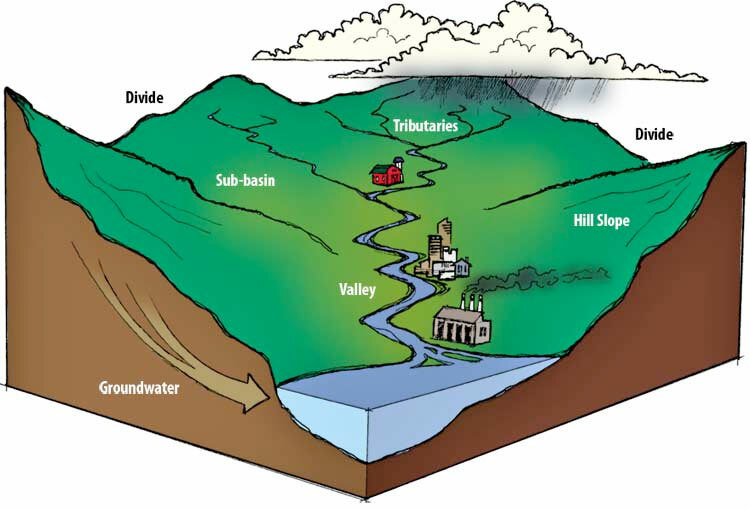 The underground boundaries of the ground water that discharge into the surface water body do not necessarily correlate to the surface topography and boundaries of the watershed; rather they are directly related to the underlying geology (rocks and soils) of the area. Find out more about the Aquetong Watershed. Help protect the health of the Aquetong Watershed. Stay informed about AWA events that impact our Watershed and our community! We respect your information and will not resell or misuse your email address. ©2019 Aquetong Watershed Association. No graphics or text from this site may be used without the written consent of Aquetong Watershed Association.